There are literally hundreds of ways in order to decorate your church or wedding ceremony site on your wedding day. When you walk down the aisle in your beautiful wedding dress with your dad arm in arm, nothing would make you prouder than having impeccable beauty all around you. The decorations help to create a lasting memory for you and your wedding guests and the photography from it will come out stunning. You need to start by discussing decoration plans with church officials and ceremony administrators. They might impose some limitations on some of the things you would like to do. They might just offer you ideas too and may even have extra decorations in a storage room if you want. You might need to consider how the church lighting will play into your decorative scheme. Some decoration ideas just won't work in lower lighting facilities you often find in many churches and chapels. Consider decoration designs for aisles, altars, pews, altar railings, entryways, centerpieces, banisters, columns, steps, walls, around stained glass windows, and ceilings. Decoration supplies for churches and ceremony sites can be found at rental supply stores, church gift shops, garden centers, florists, art supply stores, picture frame stores, dollar stores, and from online websites. You might consider decorating to the theme or color scheme of your wedding or match to the color scheme of the church. 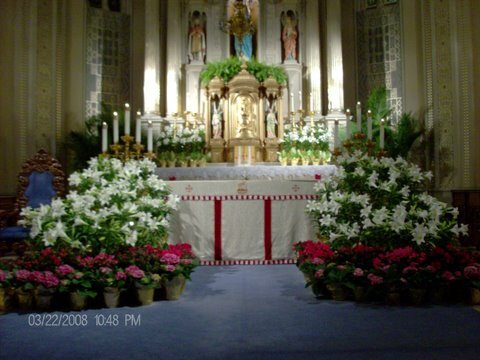 Decorate the church with color schemed flowers, candles, bows, fabric, and ribbon. You might fancy up your aisle with a beauty aisle runner, most come in red, white, or ivory or you can special order one in your color scheme. There are hundreds of ways to decorate each side of the aisle including decorating with all sorts of plants and flowers, decorate with pew bows, colored ribbons, vases, arches, draping gossamer, line the aisle with pillared candles, candle lamps or hurricane candles. You can decorate the space with all sorts of floral arrangements, hanging flower balls, pearls, lace, beads, crystals, hanging plants, tulle, the list is almost endless. You can get ideas for church decorations from church websites, and look at Youtube videos, Pinterest Boards, and Instagrams for decoration ideas. Most eyes for much of the wedding ceremony is fixated to the front of the church, you should have a little focus of decorating the area there. You might start by creating a bouquet bed of flowers near the altar, either on top of the altar or directly in front of it. You might include a few religious heirlooms on the altar such as a crucifix, a bible, or rosary beads and have them blessed to ward off evil spirits in your home. 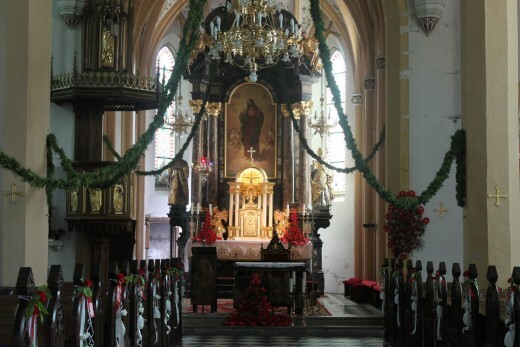 You might think of creating some sort of matching flower stands to both the left and right of the altar. 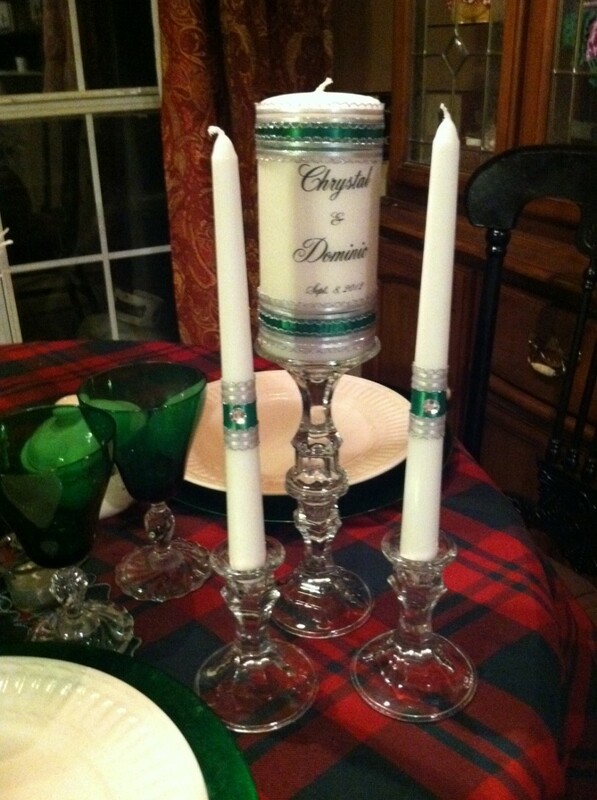 Many weddings are decorated using a candelabra which is a decorative piece that provides multiple holdings for tapered or pillared candles. At some weddings, art work or sculptures are added to cover altar area bare spots. The pulpit might be adorned with a ribbon or a little bit of evergreen or pine and needle decoration. Some couple create a decorative spot for the lighting of a unity candle during the ceremony. The mothers of the bride and groom light a starter taper candle, then the bride and groom take the taper candle and light the unity candle which is a large pillared candle together. At some ceremonies unity sand is used instead for the ceremony. Small vases are filled with colored sand one for the bride and one for the groom. The ceremony includes the bride and groom pouring their colored sand into a larger clear vase together creating a beautiful decorative piece as a reminder of the ceremony for their home. 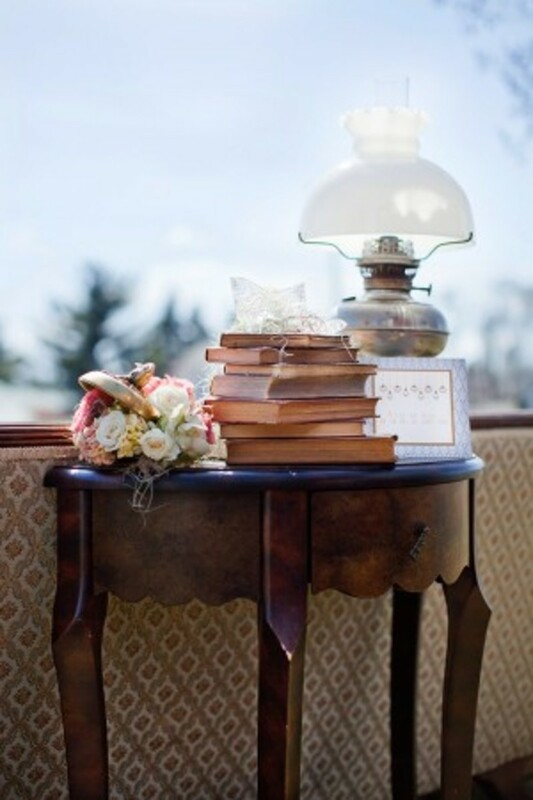 Don't forget to decorate the wedding guest book table. Usually near the entrance way a sign in book is placed for wedding guests to sign. Decorate the wedding guest book table with a photo of the wedding couple, maybe include a pillowed mint jar on the table and have a vase with a flower arrangement in the back of the table. Make sure the guest book and the paper is of high quality to last for a lifetime. Make sure the guest book comes with a really good writing pen that writes the first time and loaded with premium ink that does not smear or splatter. You don't have to go all out to decorate the front door of the church much. You do want to decorate a little. Decorate the front door one of four ways, put some type of decoration on the front door, it could be a decoration with a wedding bell, flowers, or some type of greenery. Second, you could put the same type of decoration above the door. Third you could put some type of planter, vase, greenery, or flower arrangement on both sides of the front door. If you have two front doors, use three decorations, one to the left, one in the middle and one to the right. 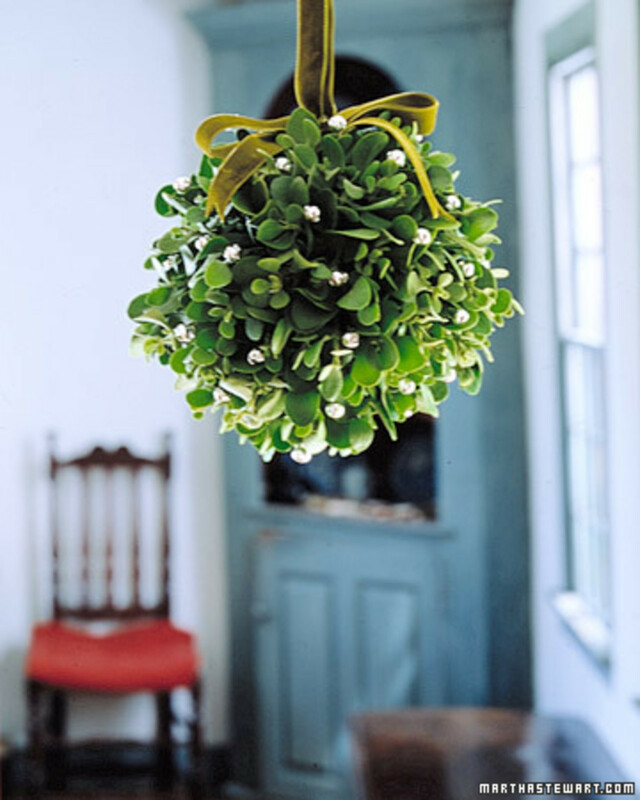 Fourth, you can create an arch arrangement around the front of the door decorated with greenery or flowers. If there are trees or shrubbery near the front door you might apply a little additional greenery to make them a little fuller. You might put clear or white Christmas lights in them for added decoration. If there are steps leading to the front door you might place potted plants on every other step. Place similar potted plants both on the left and right. Make sure you consult with church officials before buying and decorating them and get their okay. There are a number of ceremony areas you want to focus on. 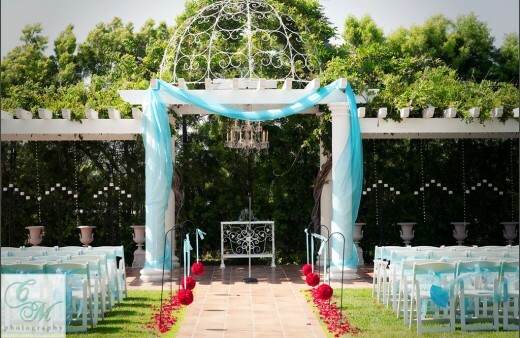 First you want to decorate the focal area of the wedding area which may be an arch, arbor or gazebo. The second area to focus on is the wedding aisle, the third area to get attention is the seating area, the fourth area to put a little attention is the entrance way, and the fifth area is for indoor weddings and that is ceremonial lighting. First is the arch area and is the area in which the wedding ceremony takes place. You want the focal point overlooking a beautiful spot. Ideally you want wedding guests to see the wedding couple in a beautiful background. The background could be a beautiful skyline, a body of water, a waterfall, a big mountain, or a national or historical monument. If there is no beautiful setting in the spot you might create a beautiful backdrop using wedding drapes or by hanging crystal or garland from trees or bring in potted trees and hang decorations from them. For the arch, arbor, or gazebo, you want to decorate all borders with some type of greenery, flowers, fabrics, ribbons, and bows. You could hang floral bows, place ribbons or wedding bells off to the side or to the backside or the arch a little. You want to wrap the decorations around and around the edges, decorate step back to see if you like the look and readjust your decorations, get securing tacks from art supply stores or picture frame companies. Look for arch decorating ideas from websites, Pinterest and Youtube videos. For your wedding aisle, you have all sorts of possibilities. You can put down an aisle runner, you can place a bed or flower petals to the side of the aisle runner looking like a beautiful path. You can place flower petals on each side to form a path on grass or in the sand to create a beautiful view to the arch. You can line the aisle many different ways. You can put decorative bows on the corner chairs. You can create an archway using one, two or three aisles and decorate the arches. You can hang a beautiful wide hanging ribbon along chair edges to create a pretty path. You can line the aisle many different ways. You can line the aisle with flowers, potted plants, with all sorts of greenery, you can hang the bride's childhood pictures on her side and the groom's pictures on his side hanging from each end chair. You can put up a shepherd's hook next to each end chair and hang a flower arrangement, hanging plants or a floral balls from each pole. You can decorate the aisle with all sorts of beach paraphernalia or nautical decorations. You could line the wedding aisle with rolled beach towels and give them as a wedding favors after. Or you might create a bed of flowers as your wedding aisle. If the ceremony is toward the evening you might think of decorate the aisle using some kind of candles, maybe hurricane candles. Look for more ideas using the internet. You can create a lovely seating area. You can put chair covers on all your seats creating a beautiful decorative touch. You can use something besides conventional chairs. Have all your guests seat on picnic benches, haystacks, tree stumps, or if your at the beach, beach chairs. Each beach chair could be taken home as a wedding favor. You have a choice, decorate all the chairs or decorate the chairs near the wedding aisle and a few in the back. You also might arrange the chairs in a semicircle facing the arch getting a good view of the ceremony instead of straight line aisle seatings as most church seatings do. At the entrance way of your ceremony site you could also erect a decorative arch, but don't decorate it as much as the ceremony location. It just let's guest know the entranceway location and makes the spot a little more pretty. Decorate the arch with a little greenery and flowers wrapping and covering all the edges. Around the entrance way create a little wedding scenery. You can create a scene with a heart created using flowers petals. If you are at the beach, you can place little decorations around using seashells, starfish, and sand dollars. You can create nautical decorations, old fashioned beach chairs, or light houses. Near the entrance arch you can have beach pails full of wedding favors. Your first pail includes a message in a bottle which includes the wedding program, the second pail includes beach sandals or flip flops, the third pail includes a mini paint brush to wipe sand off of feet or shoes, a fourth pail includes a fan to fan you front the heat, the fifth pail includes sunglasses, and the sixth pail includes a throw away camera. You might want to decorate the edges of your wedding ceremony site. You might want to decorate trees and bushes with netting lights, you might strategically install solar lights if the event is planned for the night and hang clear and white Christmas lights from trees and bushes. Hang crystals or garland in some tree areas. If you are at the beach, at the edge of the ceremony site you might want to place some beach umbrellas to surround the ceremony site a little or hang wedding drapes to create beauty and maybe a little protection from the wind. Create a little space using the wedding drapes and place a little seating area with a table inside. A place for the bridal party and for some senior wedding guests to rest. Place a few decorations around such as Chinese lanterns and kites for the beach and create a neat sandcastle on the beach. If your event is indoors, decorate the space with beautiful colored schemed flood lights. You can decorate high ceilings with color schemed tulle and wrap poles with fabric, flowers and tulle. Put a little extra floodlight pointed toward the wedding couple. Use color schemed light to put a little awe and fantasy in the air. 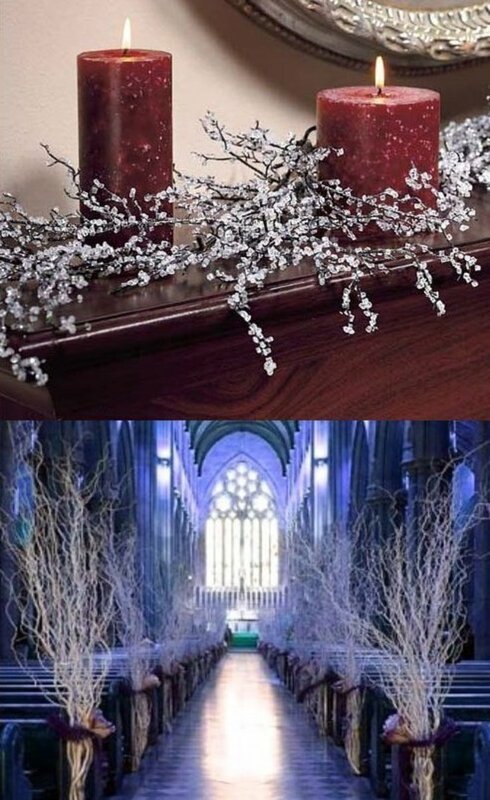 Decorate a non church wedding space to a hobby one of the wedding couple's has. Happy decorating!